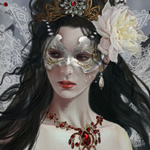 Anchi is a Russian artist, I do not know very much about her. Her website is in Russian. I believe her name is Anna Linberger. Her photo sharing is restricted, I am unsure how to share them here because of that. The links above will have many photos though. Dolls Gentle Creation is author sharnirnirnye collectible handmade dolls limited edition. They are made ​​of fine porcelain and painted overglaze colors that will never be erased and will not change the color of the sun and dirt. process of making dolls is very long and complicated. All parts are molded, processed, and are painted by hand by me. Therefore, each doll has its own individual character. In Gentle Creation 18 joints that allow the dolls take almost any pose, even the most flexible inherent to the human body. Knee joints are my own invention, which I spent a lot of time, bringing it to perfection. They make a puppet legs very mobile without disturbing anatomy. All wigs have kuklol made ​​from the finest natural mohair, which can do everything the same as with real hair. They can be washed, combed and styled in different hairstyles. All wigs are removable, which makes them easy to change and experiment with doll images. eyes dolls are 2x types of painted or false. Plug eyes are made ​​by hand to order. They are made ​​of special material, which is much more transparent glass, which gives the eyes a "live view". Eyes is a mirror of the soul and the doll, I believe, too. Therefore the choice of the eye is very large, because each doll has its own character and its puppet soul. Dolls Gentle Creation collected on a special tight elastic on alternative technologies. This allows them to easily and smoothly take any pose in the hands of the owner, but it is very tough to keep them. With this assembly pupae never crumble against tampering. In the present dolls laying of skin for an even better holding poses. All my naked dolls have small circulation Order (only 30 pieces). This makes them not just puppets for the games, but a unique addition to any doll collection that will delight more than one generation of owners. Her dolls are 33 cm tall. I love these dolls! When I decided to get my first porcelain doll, narrowed my choices down to this artist, Angelika Balan, and the Paperwhite Dolls. I finally chose Paperwhite Dolls. I decided against a Gentle Creation doll because they have elastic instead of steel springs. But since then I have handled several porcelain dolls strung with elastic and I am not as against it as I was. Her dolls are so beautiful! I think anna said she didn't like the sounds of the springs, and there is the whole rust factor when it gets wet. While elastic is easily replaceable. Also elastic enables you to hide jointing a lot more. Once springs get elongated it no longer has its original properties, while elastic will keep it very well for a long time, until it needs to be replaced ^.^ there's a bunch of pros and cons between elastic and springs. 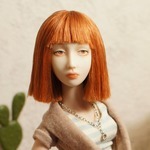 This artist is very talented and very good at replicating portrait dolls. I wish the porcelain had a more translucent appearance. Oh that is very interesting! I actually like the creak of the springs in my dolls. I didn't think about how it affects the joint design though! And I know more care is needed with springs to make sure you are bending each joint the right direction. I agree she has so much talent! What an interesting discussion. Yes, I don't think it matters whether they are strung with elastics or springs. One of my best posing dolls is actually a mass-produced MSD strung with elastics. My worst posing dolls are also strung with elastics. I have a Lutz Lishe and Soo from 2005 and they are horrid for posing! In the book Learning to be a doll artist by Martha Armstrong-Hand she used a method that had a loop of elastic in the torso part of the body and springs for the limbs. Now back on topic, I've been following Anchi's work since she had a thread on the ED forum. I really like her Kristin Stewart doll a LOT. Great job at capturing a likeness. I hope she joins this forum herself. I also followed Anchi while she was on the ED forum, and I agree I hope that she finds her way to this forum. I did not know that her dolls were strung with elastic. Does that effect the lasting power of the porcelain doll? It would have to be restrung every so often. I would be worried about damaging the porcelain in the process of restringing. I agree, her Kristin Stewart doll is amazing! I will be sending a formal invitation to her and every other doll artist I can track down the email of! That is a great idea Allurose! I also like the shape of her dolls, they seem more curvy l. I also like her jointing it is less pronounced since it is hidden in the curves. Anchi also seems very sweet. These dolls are lovely. I can't seem to get to her website using the link on this page though. Perhaps it is not active anymore? Skulptress, it was a coding mistake. It should be a working link now.